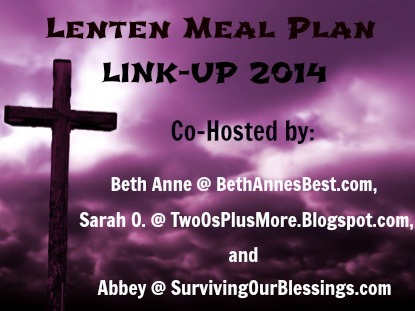 Welcome to the 2014 Lenten Meal Plan Link-Up!! This is my third year to do this link-up and I’m so excited for it to be back again! It’s always a great community builder and an easy way to find new recipes during the Lenten Season. This year I have Sarah O. from TwoOsPlus More and Abbey from Surviving Our Blessings joining me to co-host this link-up. 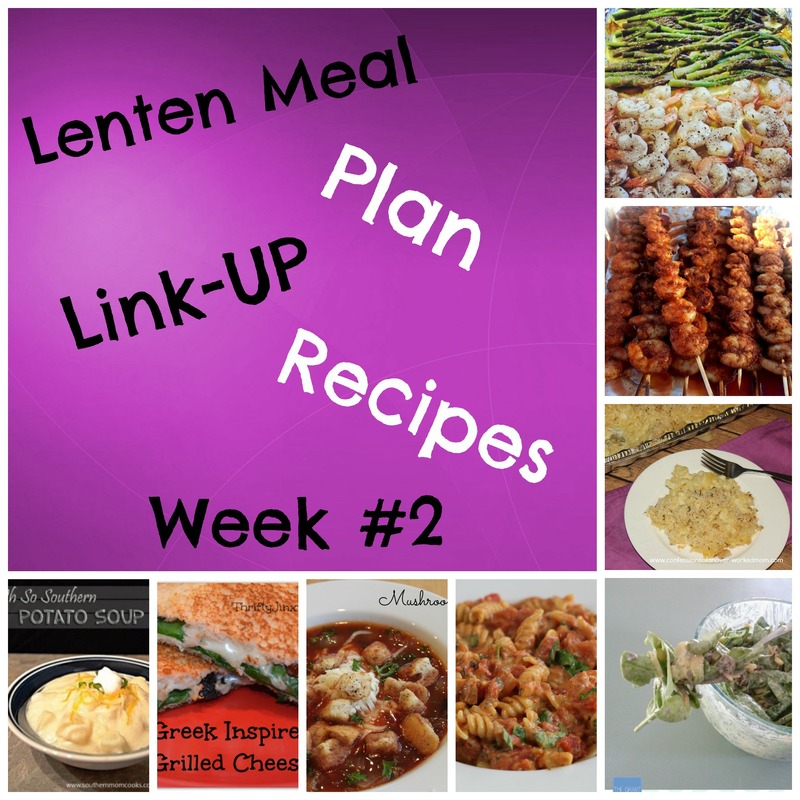 Welcome to the second week of the Lenten Meal Plan Link-Up!! Each week I will be sharing some recipes that I have received from other bloggers to share along with some recipes that I have tried and eaten throughout the week. 1. Shrimp Recipes from From Gate to Plate – One of my favorite seafood dishes is SHRIMP. It also helps that Shrimp is usually Buy 1 Get 1 Free in the grocery store. Here are two recipes that look really good. Bloody Mary Shrimp and Baked Shrimp & Asparagus. 2. One-Pot-Tomato Basil Pasta – I LOVE tomato basil soup and eat it often. Here is a twist on the soup with added pasta. Normally I do this anyway by adding small soup noodles. I will have to try this variation of the recipe. 3. Fiesta Ranch Salad from The Grant Life – I’m not a big salad person and I’ve never had corn or beans in a salad but this salad looks SOOOOO GOOD. 4. Baked Macaroni and Cheese from Confessions of an Over Worked Mom – I LOVE Macaroni and Cheese. It’s a comfort food for me. I’ve been really craving it lately too so I’m hoping to make it eventually. Bonus this meal can be made ahead of time and put in the freezer. 5. Soups – Like I said in #2 I LOVE soup. I probably eat soup at least 4 days a week. Sometimes during Lent I’ll eat a nice bowl of soup and a grilled cheese sandwhich. It’s especially good on a cold or rainy night. I’ve found several meatless soups including: Potato Soup, and Mushroom Onion Soup. You’re Welcome! There have been a lot of great recipes shared this year!